Beth Garcia, Zak Garcia and Debby Garcia make up the Garcia Team. This is the 2nd time in three years the team has achieved the honor of Agent of the Year. We help our clients through the entire buying or selling process and are fortunate that many have become life long friends. Coldwell Banker Seaside Realty, a leading real estate firm located at North Carolina's Outer Banks, would like to congratulate the Beth Garcia Team for earning the firm's 2015 Agent of the Year award. "We are very grateful to have careers that we love and to live in such an incredibly beautiful place. We help our clients through the entire buying or selling process and are very fortunate that many have become life long friends," says team leader, Beth Garcia. In addition to earning the Agent of the Year award, The Garcia Team has also qualified for membership in the Coldwell Banker International President’s Circle. This prestigious membership has been awarded to the top six percent of all Coldwell Banker sales associates / representatives worldwide. The team accepted their award at the beautiful Duck Woods Country Club on February 9, 2016. 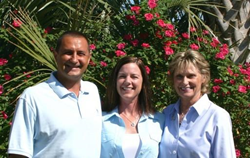 “Few Broker’s in the Real Estate industry give their clients the care and attention that Beth, Zak and Debby give. That is why they are consistently achieving great results for all of the clients they serve,” says Gordon Jones, President of Coldwell Banker Seaside Realty.